You can’t be in India this time of the year without being stuck in conversations about the IPL (Indian Premier League) cricket matches. I don’t know a single Indian who isn’t watching it on TV or streaming it live on Youtube. In my latest attempt to fit in, I agreed to get in on the bet with “A” and his friends and put my rupees on the Rajasthani team. I, of course, know nothing about the game or the team and I merely picked them because I loved visiting Rajasthan. I’ve lived in the US for 10 years and I might have been to maybe six or seven baseball games but have never successfully learned the rules of the game. A month ago, “A” got us IPL tickets and on our drive to the Chinnaswamy Stadium, “A” gave me a 15 minutes crash course on cricket. 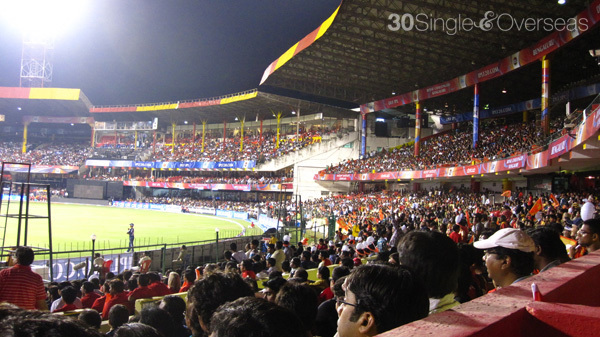 The stadium, as expected, was too crowded, and so were its surroundings. Walking towards the stadium was an experience by itself. In the midst of the thousands of people who were trying to get into the stadium and the heavy bumper-to-bumper traffic, there were vendors, who would try to sell cricket team shirts, nimboo pani (sweet lime juice), roasted peanuts and face paints. Last week, a good friend of “A” scored some really good tickets from work. 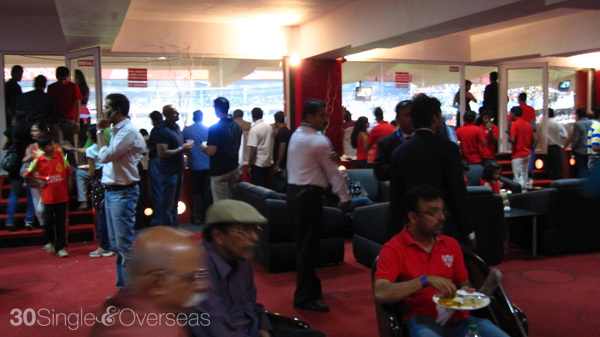 We arrived at the same stadium 30 minutes late but instead of waiting on a long queue to enter, we were escorted to our seats, in the executive lounge, which I found out later costs Rs2500 (US$55) a piece. View from our seats. 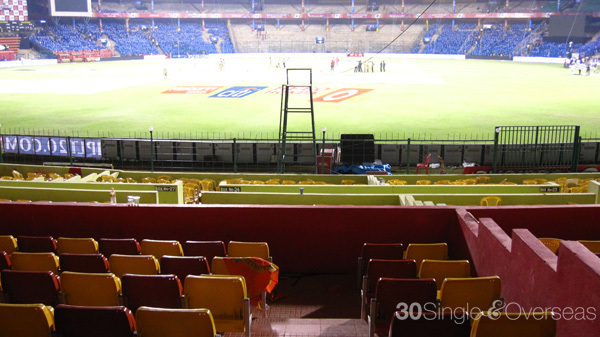 We were seated so close to the field, I could almost see the expressions on the cricket players. 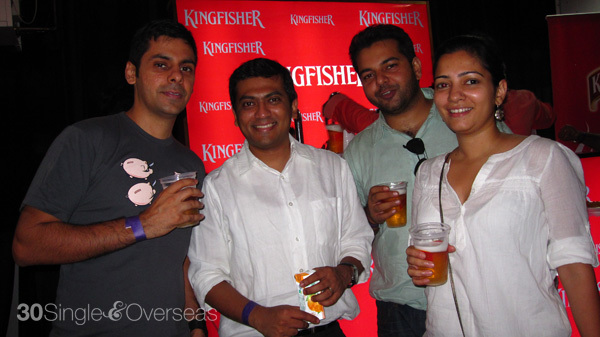 We also had access to a buffet table with yummy Indian food beautifully laid out with unlimited amounts of Kingfisher beers, all available to us in the air-conditioned lounge. Apart from the few drunken rowdy men, the crowd here was pretty tame compared to the noisy mass on the other side of the stadium. Take a pic with the cheerleaders. Cheese! Post-match. Hyderabad beat Bangalore by 7 wickets. We didn't eat much and didn't get invitations to the after party, so we ended up here after the match.